My furnace is out. It’s about 15C in here right now, and although I do have a working space heater in my office, said office does not have a door and so I am still cold! Wearing lots of layers, but I just realized that I don’t have any fingerless mitts for sitting at the computer. Sigh! 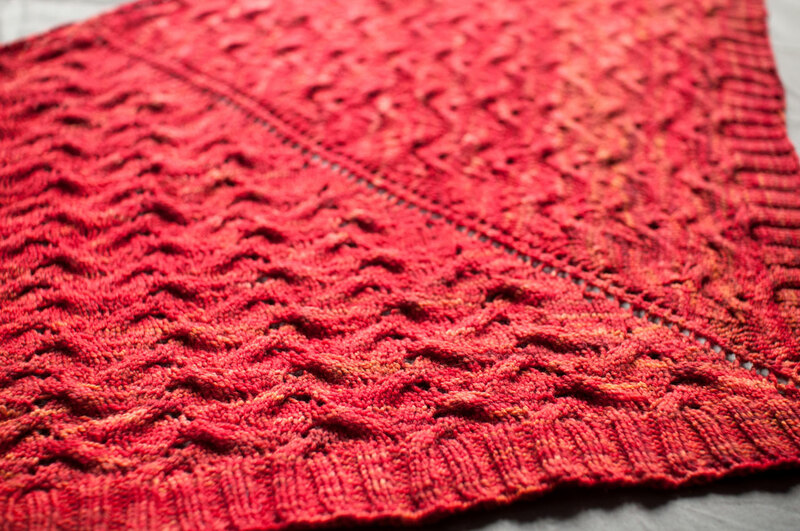 Anyway, I wanted to let you all know that the Hibiscus Shawl pattern is back up, with stitch counts and corrections. If you already purchased it you should have received an update email from Ravelry. 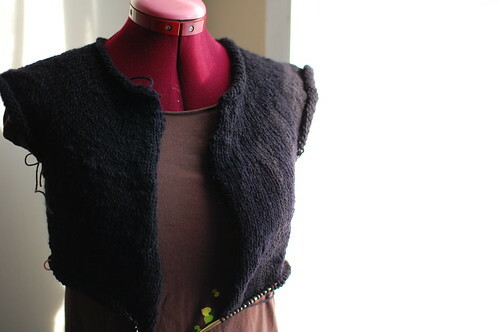 It’s a basic circular yoke top-down cardigan, in oh-so-useful black. I wear my dark Lucy in the Sky a lot, and I could really use another black sweater! Coming along pretty quickly at 4 st/in. And here’s a treat for you all – a bit of video from our performance the other night! It isn’t the whole thing, but the quality’s pretty good. Enjoy! Wow, that was a great performance!!BRAVO!!! If you knit some fingerless mitts they work up pretty quickly. I hope the furnace comes back on soon. last year our power went out for a week due to ice and snow I was layering a lot of sweaters,etc.I even put some on my pets, I refused to leave them because the Emergency shelters don’t allow pets and I wasn’t leaving my furry babies( dogs and cats) behind. Stay warm. that was AWESOME! you guys totally Rocked! :) wish I lived in Toronto so I could have you guys at my birthday party! Great performance!! I love handbell groups, but I’m already involved in a concert band. Isn’t it amazing that if it were spring, and 15C, you’d be feeling warm, maybe wear a t-shirt. But since it’s still winter, it seems colder than if it were April! Holy cats, that was impressive! I’d love to come see your next performance. hi! Awesome performance! I am a handbell player myself – a church group, about twice the size of your choir (and probably twice as boring, really). I would love to hear more – of your playing, as well as how you came together, etc. I used to play in a small ensemble, but creative issues lead to our demise. I think my favorite piece was Brubeck’s “Take Five” played with just six players. Tons of fun! p.s. I admire your knitting designs equally as much!